The best Portuguese wine I’ve ever had? It’s really not saying much. In our everyday liquor stores there’s no renaissance of Portuguese wine the way there has been with Spain and Chile. Maybe it’s access, domain, importation issues, whatever, it just seems that decent, reasonably priced Portuguese wine is not the ordinary here. 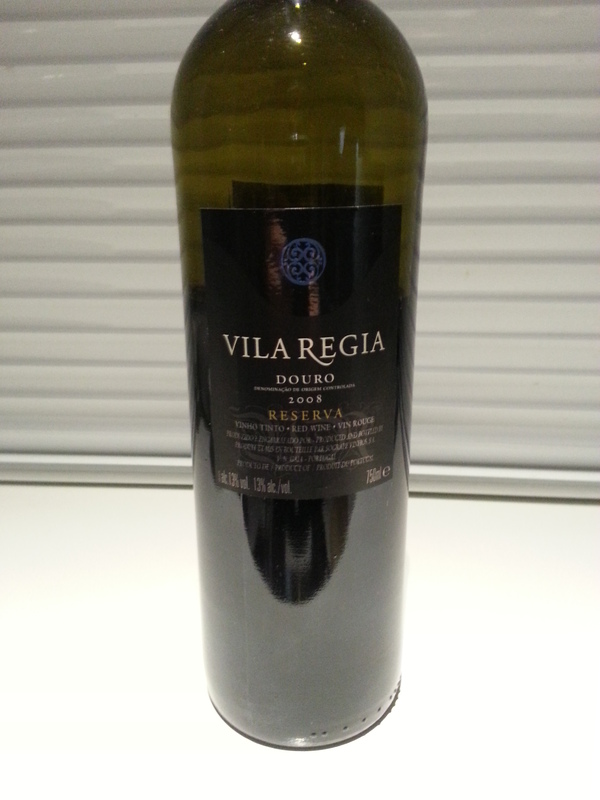 To date we only have one other Portugal wine on the blog and it was a bust. No hyperlink! But this fine red blend (of many grapes I’m unfamiliar with except Tempranillo) is far from ordinary. Rich and mellow and with just a touch of tannins. It has had some glowing reviews and in general we agreed with the theme that it’s fruit forward, with darker, woodsy flavours on the rebound. It sells for as little as $13 in many parts (and, no, I’m not confusing the everyday Villa Regia with the Reserva) but alas, and of course not in the land of 130% wine tax, should it go for a song. Still, at just shy of $20, worth it through and through. We drank it on its own with much enjoyment then sipped it with homemade meatballs and it even cut through the rosemary basil tomato sauce with finesse. It should be a house wine at average joints but of course that is asking too much. How the other half live. A most fine example of what could be the average BC bottle but unfortunately isn’t. If you can find it you’ll pay at least $39 a bottle, but probably more, so obviously I’ve never bought it. Gentle, but not obsequious, not some mild-mannered red blend made from the dregs of the varietals. Markedly Merlot on first sip but transitioning, blooming into something much more, with flavour of dark fruit, a little leather and quite a bit of oak (more than the server said there would be, anyway). Sips beautifully and went well with dinner. Why in the hell Robert Parker hasn’t rated this 90 points or more is beyond me. We had it off the wine list at a vegetarian restaurant in Vancouver, and the only reason we coughed up so much dough to drink it is that we had a gift certificate to cover the dinner. So what the hell. But no disappointment; it was worth every cent. It has surpassed the praise I heaped on a bottle of (the much higher priced) Nota Bene. 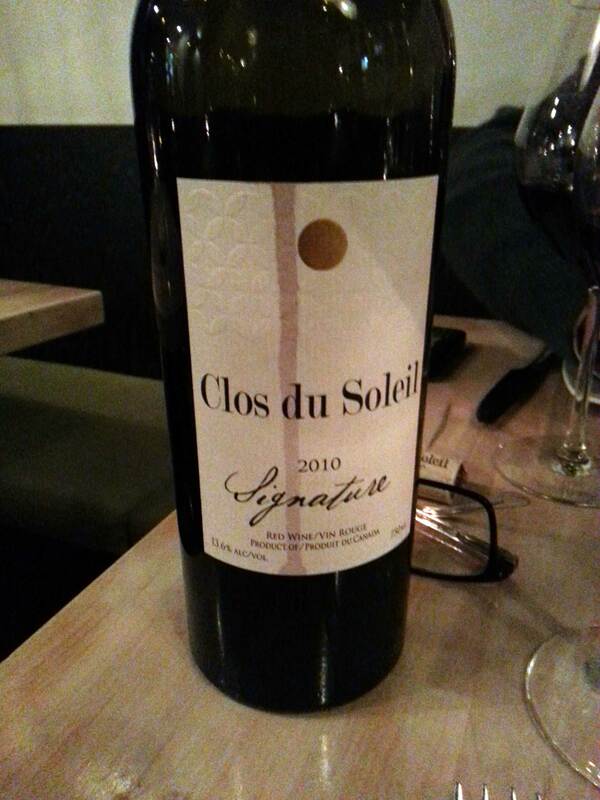 If you need a special red for Family Day or Valentine’s Day or just because you want a nice bottle of wine on Nice Bottle of Wine day, make it this stunner from Clos de Soleil. The streak on the label is simply a drip of red wine, but I think it actually improved the label! Market Liquidity: Please sir, I want some more. An imperfect red blend that drinks perfectly. 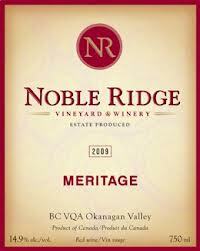 Sharp, tart, chalky, acid, leathery, smoky, and a lovely lingering cherry oak finish. Quite sensational in its own quirky way, like a favorite t-shirt with a few frays and stains, and not quite as refined as you would expect at this price point. We love Nichol, when our pocket book allows, and this was good, although not quite up to some of their varietals; see our links here and here. Drank as a sipper a little better than with food (quite surprisingly a disaster with a hearty homemade meatloaf) but we finished it off promptly nonetheless. I would describe this wine as the beta version. It will get better and better on future releases. I hope. As it is now it’s more conversation piece than keeper. Price: $27.45 at Legacy Liquor in the Olympic Village. 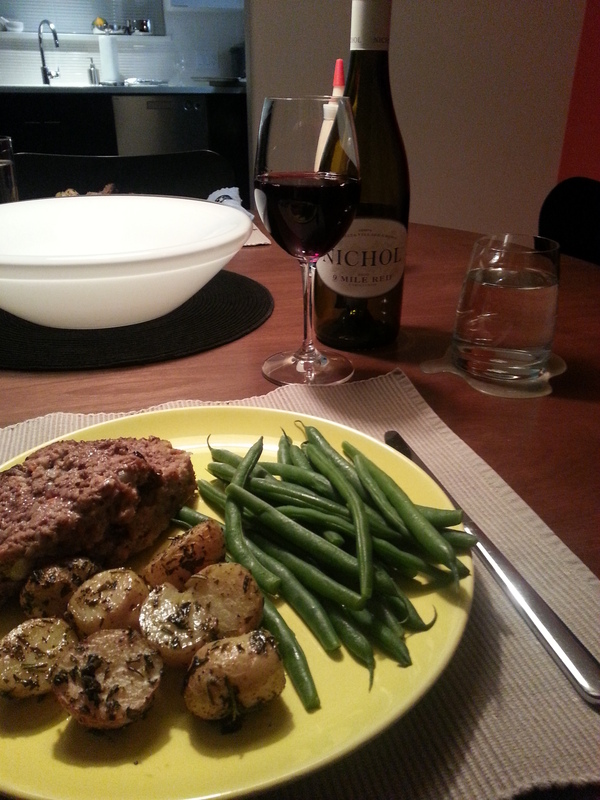 Market Liquidity: A spectacular $20 bottle of wine, $7.45 over budget. A very ballsy chardonnay. Robust, forward, nothing restrained. That’s another way of saying it doesn’t have that delicate, French style of refinement common in those over-the-top pricey Burgundies, which is not a partisan comment, it just is. We took a pass on their everyday chardonnay, but this lovely bottle gave us pause. Wicked legs. Think Usain Bolt. It could stand up to some very hearty fare, I reckon, although we sensibly had it with salmon (wild sockeye, baked, a little garlic aioli on the side). If you like a bold, direct and assertive white, this is it. And, frankly, after several bottles recently of Pinot Gris, Riesling and Gewurtz, it was nice for a bit of a shock. Price: $17 US in Seattle, the red “equivalent” is $30 in Vancouver at private wine shops. Market Liquidity: When it’s do or die. Damn easy to drink. A gorgeous, approachable blend from Famille Perrin, part Syrah, but (to us) it tasted more of the Grenache, with not too much of the heavy spice of Syrah, and more of the (pleasant) bitterness of Grenache, fruit and chocolate, and like velvet. I got a new toy at Christmas, a Menu Wine Breather Carafe, and we “double-decanted” the wine before drinking. Unfortunately I didn’t keep a “constant” to compare, but this opened up incredibly with the “device” which is either because the wine was so good to begin with or high praise for yet another wine-lover’s accoutrement. We had it with leftover ham from Christmas (a lovely quiche Lorraine) and assorted vegetables and it wasn’t the right wine, too heady and deep, but before, with salty snacks, and afterwards, just as a sipper, it could do no wrong. Price: Not cheap, but it was recently on sale at Everything Wine for $23. Market Liquidity: Another wonder from the Rhone. Heady. Berries, clove, licorice, vanilla. Intense and forward with an enticing fragrant nose. Not tannic; although stratospherically alcoholic. It could mellow over the coming year or two. At the price point miraculous. Mainly Merlot. But blended expertly. A wonderful winter warmer, if a touch potent. I was gifted (thank you Santa, and my sister!) one bottle, but if I had a second it would go down in “the cellar” for 18 months minimum. Screw top; thank you for that, too. Price: $20 from the vineyard, as it was a gift I didn’t source locally. Market Liquidity: BC can be brilliant under $20; unfortunately that price point is rare. Sandhill Small Lots are some of the most spectacular (accessible) BC wines; we have some gushing reviews on this blog. But like Banana Republic’s Monogram line or Brooks Brothers’ Black Fleece, decent brands are always separating out their “quality” from their “superior quality.” And it gets tiresome. Sandhill does it with basic Sandhill and their lovely Small Lots program. This basic offering is a bit innocuous as a sipper, but quite fine with a vegetarian main: Braised fennel in thyme, garlic, wine, coriander, cumin and Moroccan olives along side Matiz sardines in lemon. Light, an inch away from effervescent, stony, pear and/or apple-ish, ripe and full, but we got no notes of vanilla or pineapple (as stated on the label). Worth trying, yes, but I doubt we’ll repeat. Price: A reasonable $20 at BCL. Market Liquidity: Could have done worse. From the cellar: Yes, it was Christmas, so another of the last few 05 Bordeaux bottles came out from the cellar. And, like a virgin birth, it was a miracle. As Lawrence Welk might have put it, wunneful. Any smoother and it’d be suede. Not an ounce of tannic bitterness. Make this wine gentler and you’d be leading your blind granny across the street and tithing 25 per cent of your income. Very, very rewarding for a “lie down” and most certainly worth the half decade wait. Search elsewhere for superlatives: Just trust me, if you see a bottle on a wine list, nab it. Price: Same old story; all the 05 Bordeaux’s were expensive.